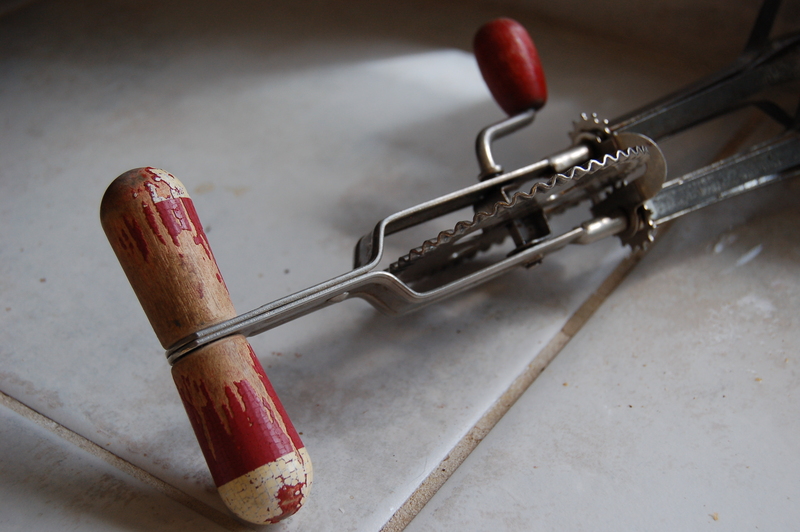 On our Idaho trip, our souvenirs included a ziploc bag full of hand-panned garnets, a 1914 toaster in need of a plug, and a hand-crank eggbeater, because The Child always wanted one. I already have plenty of antique kitchen utensils that I inherited from my grandmother, some of which are in daily use, and some of which I simply gaze at fondly from time to time. Our souvenirs fit right in to my collection. Among the items in my collection is my grandma’s flour sifter, which I’ve never seen the point of but which I believe she used nearly daily for fifty or more years. My father swore it was the best flour sifter ever made when he used it for his dedicated* and extensive bread-baking on his last visit. He, too, sifted his flour endlessly. I still didn’t see the point of it. Flour is pre-sifted. Why bother? So when I ran across the recipe for Busy Day Cake on the fun Handwritten Recipes blog, I noted that it called not only for a specific type of cake flour, but also that the flour and dry ingredients be repeatedly sifted, and given the recipe is a bit, well, vague, I figured I’d best follow what few instructions there were as precisely as I could. The recipe’s call for specific brands – Swans Down cake flour and Calumet baking powder – led me to believe that it originally came from either the back of a box or a company-produced cookbook. A search around the internet reveals a number of similar recipes, as well as the fact that several company cookbooks were produced over the years. I used the handwritten version on the blog, which I’ve reproduced below with some edits and corrections. Sift dry ingredients together three times. Put all together and beat three minutes. Bake in 3 greased 9-inch pans, 25 minutes at 350° F.
A couple of notes: On the blog, the quantity of butter is given as teaspoons; I used tablespoons as the handwritten version uses a capital “T”. The instruction about the eggs is rather baffling, but I followed it this way: crack the four eggs into a measuring cup, then add milk up to the one cup mark. Add this to the dry ingredients, followed by a full cup of milk. Basically, you want two full cups by volume. I used about 1 ¼ cups of milk. The cakes baked up beautifully in exactly 25 minutes. 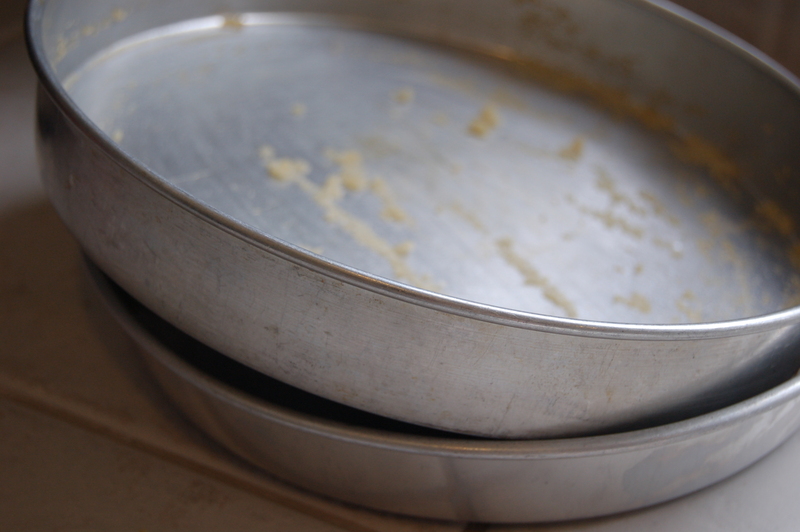 I used my grandma’s pans and, obviously, her sifter. 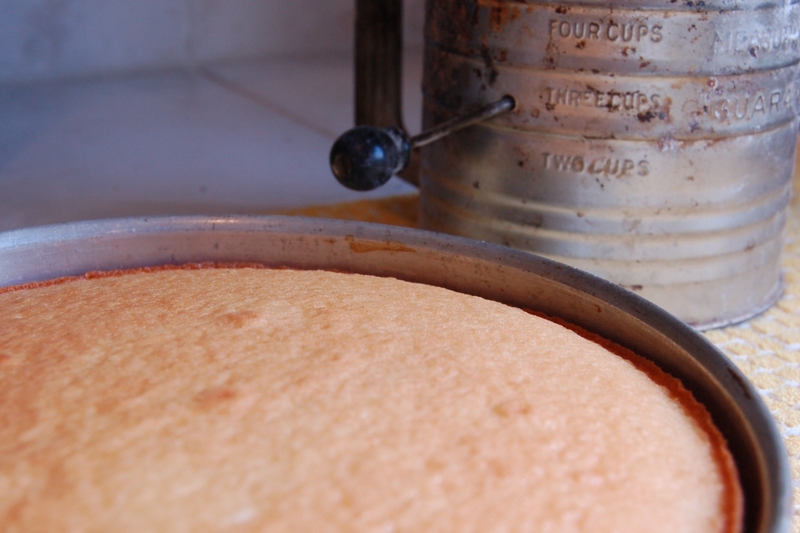 The cakes are light and spongy, a bit like angel food cake but more moist. I’m reasonably confident that all the sifting involved contributes to the cake’s airiness. The cake was great spread with a bit of nutella, and I expect would take well to any simple glaze or just a bit of fruit on the side. Various versions I found included “broiled coconut topping,” “peanut butter frosting,” and an assortment of other things that, to me, seem like overkill. 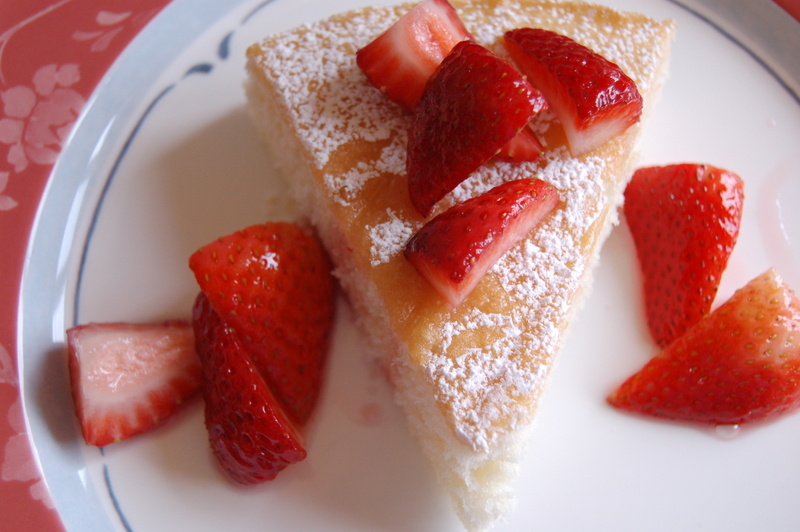 It’s a simple cake that is marvelous with a simple dusting of powdered sugar and some sliced strawberries. I enjoyed these cakes so much that I am now on a hunt to find the original cookbook and see what other vintage recipe treasures lie within. One final note: they disappear quickly. This is my contribution to Weekend Cooking, hosted by Beth Fish Reads. 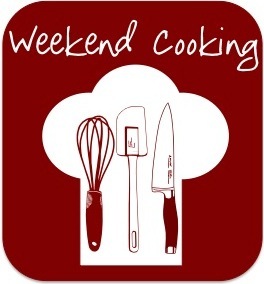 Please stop by and see what other culinary treasure await! Busy day cake, love that name 🙂 I always wondered whether sifting flour multiple times would make any difference. Apparently, it does! Your cake looks so light and airy, would love to have a slice to go with my cup of tea right now. And ugh, why indeed spoil such a pretty cake with a layer of peanut butter or coconut icing? :s Powdered icing sugar seems just perfect! Great cake. And nice to go vintage. I have linked in Coronation Chicken to Beth Fish Reads – a dish with a dash of history. I would be happy if someone gave me that cake with some strawberries and icing sugar! It looks really light and fluffy. Sifting does indeed make for a lighter cake. This looks beautiful with just the fruit. Those instructions about the eggs are interesting, but it sounds like you figured out what they meant. The cake with the sugar and strawberries looks delicious to me! Nutella on cake? Why haven’t I tried that before! It looks yummy! And how wonderful to get a chance to use family heirlooms in your own cooking.